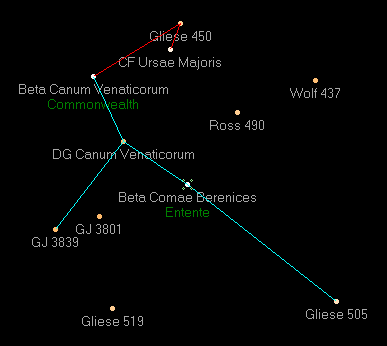 Beta Comae Berenices (Gliese 502) - Singular yellow dwarf (G0) located 30 light-years from Sol. It is under United Nations authority. Its system includes six rocky planets and six gaseous major planets. Its fourth planet, Entente, is a Terran Hestian world being colonized by humanity.